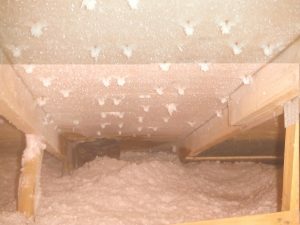 Is R50 ceiling insulation bringing back the mouldy attic? 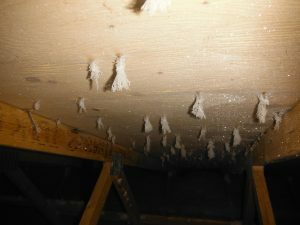 In my stomping grounds of the Greater Toronto Area, mouldy attics have traditionally been connected with poor design and workmanship of houses constructed in the 60s, 70s and 80s. Houses built in the last 20 years or so were not usually high on my list of expectations for finding mould in the attic. Sometime around 2012, along came the requirement for ceiling insulation to be at R50, a 25% increase over the existing R40 requirement. Just a short while ago, prior to 2006, the requirement was only R32. Like with “cold hands and warm heart” there is good and bad with the increased ceiling insulation. Less heat loss in to the attic means that the temperature of the roof structure and roof deck (plywood,OSB) will be lower. Warm house and cold roof means increased risk of condensation on that roof deck if any errant water vapour finds its way in to the attic. And this seems to be happening. With the cold snap this winter I came across a number of frosty attics in new construction. I’m not seeing mould yet, but that takes time. When the frost melts, it turns to water which soaks in to the roof and drips drips down in to the insulation. It may take years of wetting cycles and temperature swings for mould to flourish. However, like with any bad accident, it usually takes more than one thing to go wrong, and I am seeing the return of many of the factors that combine to create a good blue-cheese attic condition. One problem is workmanship, both good and bad. On the good side, builders are sometimes coming close to installing the depth of insulation required to achieve R50. This could be about 14-19 inches depth depending on type of insulation material. The problem is retaining this much insulation at the perimeter, and achieving this depth at the perimeter where the distance between top of the outside wall and roof deck is less. Often the installer will use batt material at the perimeter and this does double duty as a retainer and insulation. With or without batt material, the result is that much of the soffit venting is compromised by insulation tucked tightly against the roof deck. Typically a few wood baffles will be installed, but these take time and effort so they are few and far between. In the photo, insulation is in contact with the roof deck at the left, and a wood baffle can be seen at the right, and oh yes, there is warm air leaking from that bathroom exhaust fan hose. Restricted roof heights resulting in lower slope roofs and flat roofs and attic spaces with less head clearance. These lower and flatter roof styles impact attic ventilation. Narrow soffits and reduced soffit ventilation because of gable roof designs or other roof design features such as parapets. Tight houses with old-style crude heating control systems (only one thermostat) and the potential for RH and temperature to climb above desirable levels. This means any leakage to the attic that does occur is carrying even more moisture with it. Don’t panic yet. Check back with me in a few years and I’ll let you know if the beautiful white frost I am seeing now changes to the dreaded dark green of a mouldy attic.